Mobile Advertising is growing leaps and bounds in India thanks to growth of smartphones in recent times, especially in the mid to lower range. According to Opera Mediaworks India has witnessed a record growth at 260 percent since July 2013. To put it in perspective, Asia Pacific was the fastest-growing region in mobile advertising with 70% growth in ad impressions year-over-year. The growth in Asia-Pacific market is largely driven by India. India has also become the second largest mobile advertising market by impressions just behind USA. Indonesia, United Kingdom and Russian Federation round of the top 5 mobile advertising market in the world according to the report. If you see the graph above it is clear that iOS devices have miniscule (0.4%) market share in India. However, mobile advertising revenue generated by iOS devices is far more than the impressions it serves (2% revenue from 0.5% ad impressions). On the other hand Android devices contribute to over 80% ad impressions but generate just over 60 percent of total revenue. India differs significantly of whats getting consumed on their smartphones. In India, Social sites and mobile apps lead in a big way. Nearly half of all ad impressions happen on Social sites and contribute just over 48 percent of revenue. The same percentage globaly is 31% and 16% percent respectively. 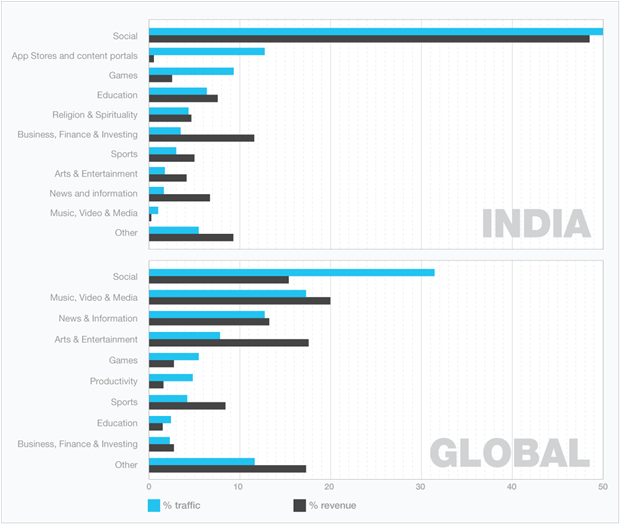 See the graph below that shows a comparison of Ad impressions and revenue generated by various verticals in India and Globaly. The Indian mobile advertising audience is young (60% are in the 18-24 age group) and predominantly male (82%). About half are “occasional” users, accessing the mobile web 1-2 times per week, but 21.6% are “frequent” (6-7 days/week), and 6 in 10 ad impressions are served to those “frequent” users. Mobile ad interactions are higher on weekends, and engagement is low during the week. Social sites and apps are most popular in usage, consistent with the global trend. However, mobile app stores, gaming and education sites, and apps closely follow, which is particular to India users. Advertisements served are mostly for games and mobile devices, together representing nearly half (48.1%) of all impressions. Classified ads, however, comprise a significant portion, with 1 in 5 impressions dedicated to the direct sale of personal transportation like cars, trucks, motorcycles and bicycles. Most ads are simple banners, but more sophisticated rich media is emerging as a creative medium. Even at only 3.2% of impressions, rich media drives 26.6% of revenue. The growth in mobile advertising in India is significant, especially considering the fact that only less than 1 in 5 Indians use a smart device. In next couple of years, the percentage of smart device users are expected to nearly double, which would increase India’s mobile advertising market share even further!